In the United States, we provide strategic advisory services to companies led by Hispanic management teams or companies that target the growing US Hispanic market. We have a similar scope of work in Latin America. Cabrera’s Global Investment Banking group addresses the intricacies of acquisitions and divestitures with a highly knowledgeable team of seasoned professionals who specialize in mergers, acquisitions and leveraged buyouts. The M&A team is further supported by all other Cabrera teams that focus on a wide range of industries and types of financing to ensure clients are provided with current market and industry information. Over the last 20 years, our Global Banking group has completed numerous M&A, advisory and private domestic and international placement assignments. Cabrera’s Global Banking division’s capital raising capabilities include equity, mezzanine and debt from private equity and institutional investors in the form of direct ownership convertible securities and debt. Our focus is on small- and middle-market businesses that target the US Hispanic market; established and successful businesses with a commercial presence or focus on Latin America; and Latin American businesses expanding into the US or in the Latin American region. Capitalization - Utilizing our deep relationships with traditional and alternative institutional investors, we efficiently raise or negotiate the placement of new capital at all levels of a company's capital structure. We analyze and craft the appropriate capital structure for a company and place the securities through privately marketed and negotiated transactions. Business Valuations - We have appraised a broad range of businesses, worth from $500,000 to $200 million. Our staff conducts valuations for a variety of entities, including ongoing small and medium sized businesses and larger company divisions with the aim of divestiture. Fairness Opinions - Cabrera's Global Investment Banking group supports boards of directors, investors, trustees, and other corporate and organizational leaders help perform their fiduciary responsibilities by providing such parties with unbiased opinions as to the financial fairness of pending transactions. Cabrera’s Global Banking division has developed a proprietary methodology to assist companies at any stage to conduct a thorough assessment of the current stance, it strengths and weaknesses as well as it’s threats and opportunities to identify strategies for a systematic growth and a very clear road map to increase its value. The approach of such methodology has been carefully designed to match the views of a potential investor considering such company as an investment opportunity. The result of such exercise is achieving an “institutional ready” stage, prior to taking the company to the financial market. The Financial Advisory services of Cabrera Capital Markets is comprised of a cohesive set of professionals, who, through various initiatives with the United States Government, have assisted in the generation of attractive returns for taxpayers and private investors. Cabrera's advisory team was sought out by the Office of Financial Stability due to decades of combined experience sourcing and pricing the types of securities covered under the Recovery and Reinvestment Act. Our long-standing relationships with top dealers, funds, money managers, and various global markets have allowed for acute distribution capabilities recognized by The US Treasury, the Department of Housing and Urban Development, and several of the government financial service agencies. The Federal Deposit Insurance Corporation, Securities and Exchange Commission, and the Federal Housing Finance Agency have found value in the consulting services that Cabrera offers. An approved counterparty to the Department of Treasury, Cabrera's advisory team brings to bear intense experience in the structuring, syndication and trading of credit in the subprime, Alt-A, prime seconds, HELOC and re-performing, sub-performing, non-performing sectors of the MBS universe. Many GSE's such as Federal Home Loan Banks, Farm Credit System, Federal National Mortgage Association, Federal Home Loan Mortgage Corporation, and Government National Mortgage Association, after consulting with Cabrera, have incorporated some of the structuring and transaction mechanics that is a key area of specialty. 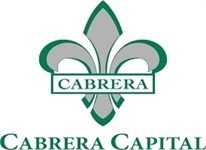 Cabrera is the preeminent minority-owned financial firm for public-private partnerships. Cabrera’s professionals have expansive experience in working with governmental entities and North American infrastructure clients for asset sales, leases, master use agreements, and alternative financing vehicles.